Beautiful views from this cozy cabin on Happy Hill. Brand new furniture and appliances! Great floor plan with gorgeous views, sun room, vaulted ceilings, private balcony off of master and great deck! This house is across the street from Shamel Park and Moonstone Beach and therefore across the street from the ocean. It has AWESOME, PANORAMIC ocean views. If you have a family with kids, this is your house. Great home! This well appointed, clean two bedroom house is located on MARINE TERRACE, just one short block from the ocean, with nice ocean views. Perfect for one or two couples. No garage access. Wireless Internet access! 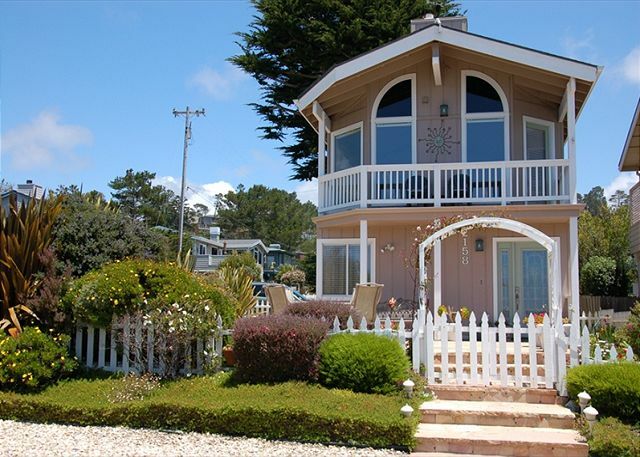 Come enjoy this comfortable Cambria beach house located in Marine Terrace. It is PET FRIENDLY (no fenced in yard) and steps away from The Fiscalini East/West Ranch. There is also Wireless Internet, Instant Netflix and Blu-Ray. This house is high up on Park Hill, with cool views through the pines to the ocean, and out to Piedras Blancas. This 3 bedroom, 3 bath house will comfortably house a large family or multiple couples. DOG FRIENDLY. Small fenced in yard. HIGH-SPEED INTERNET. Incredible ocean views, set on a quiet corner lot two blocks from the beach. Near Fiscalini Ranch & Moonstone or just a short walk to town. The single level layout is ideal for mobility-impaired persons and families. HDTV, DVDs, Wireless Internet. Quaint Ocean view home perched on top of Lodge Hill in beautiful Cambria California. This 2 bed 2 bath home has amazing panoramic ocean views, from Ocean Pines to Piedras Blancas Lighthouse. Great Lodge Hill property. The living area and bedrooms have complete ocean views. House offers open floorplan with fireplace. The deck, with seating, a table and BBQ runs the length of the house and is perfect for sunset viewing. Wireless Internet! Panoramic Park Hill ocean views! Two Master Suites with King beds and stunning ocean views. Wonderful 1338 sq ft home in Park Hill. 5 - minute walk to the beach.